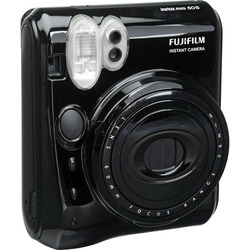 Instax mini 50S Instant Print Camera (Piano Black) brings a party along with it--the mini 50S takes a picture and gives you a 2.4 x 1.8" (62 x 46mm) color print right away, using Fujifilm instax mini instant film. This sleek piano-black camera adjusts the shutter speed automatically between 1/3 and 1/400 second to give you great results, even in low light. The built-in flash balances automatically with the background light for pleasing photos, and the self-timer lets you take two shots with a single touch of the shutter button. A close-up function focuses to as close as 11.8" (30 cm) from the lens, for 2:1 magnification ratio. 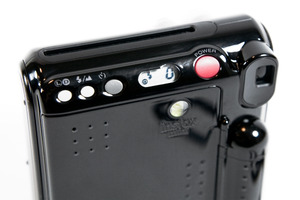 Three shooting modes (Auto, Fill-in Flash, and Landscape) are available. A Light/Dark function gives you +/- 2/3 f-stop compensation. Power is provided by two CR2 batteries. Self-Timer mode allows you to create two photos with the single press of the shutter. 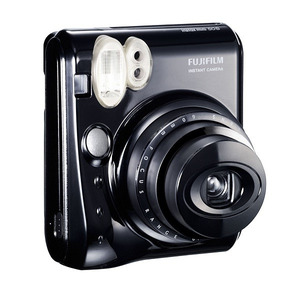 Enjoy instant photos with friends or that special person in your life. The high-performance flash mode automatically calculates surrounding brightness and adjusts shutter speed accordingly--excellent for photos at parties with subdued lighting and other low-light scenes. The close-up lens allows you to shoot from a distance up to 1' (30 cm) away so you can take great photos of beautifully arranged and colorful party food, cakes, etc. With instant prints, you can write your own personal message directly below the photo image.